I honestly cannot remember the last time I have a savory breakfast recipe, like ever. I wake up craving everything sweet, every single day. Chia pudding, toast with nut butter, pancakes, muffins, banana bread, you name it. I never eat something savory in the morning, but usually for lunch I end up eating breakfast food (perks of working from home). Usually it is avocado on a bagel or toast, an omelette, tuna salad. This breakfast pudding though, is my newest lunchtime craving. 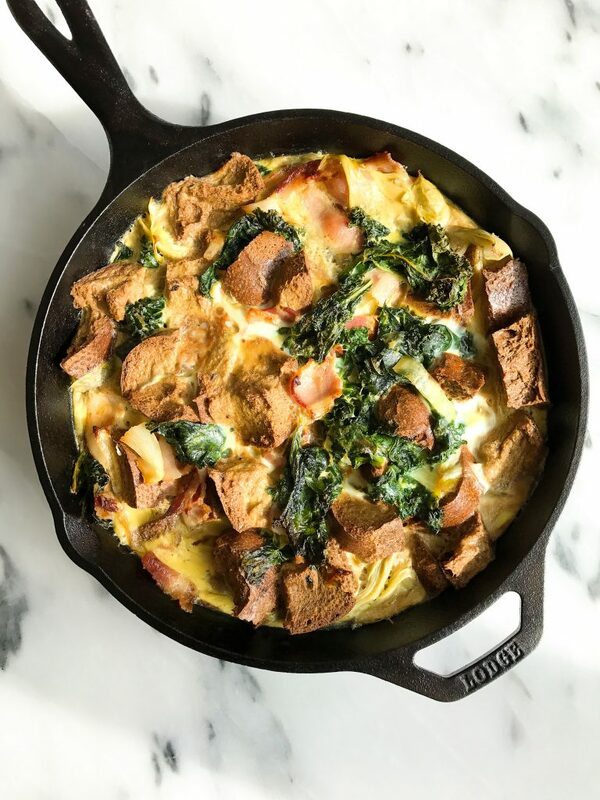 A paleo savory breakfast pudding filled with veggies, grain-free bread, and BACON. It still sounds funny when I say I ate some type of meat-related recipe, but I am loving every second of it. In case you missed it, I recently started eating meat for the first time in 5 years and I am in heaven. Lamb has been my favorite so far (more to come on that) and then turkey. Specifically turkey and lamb burgers! 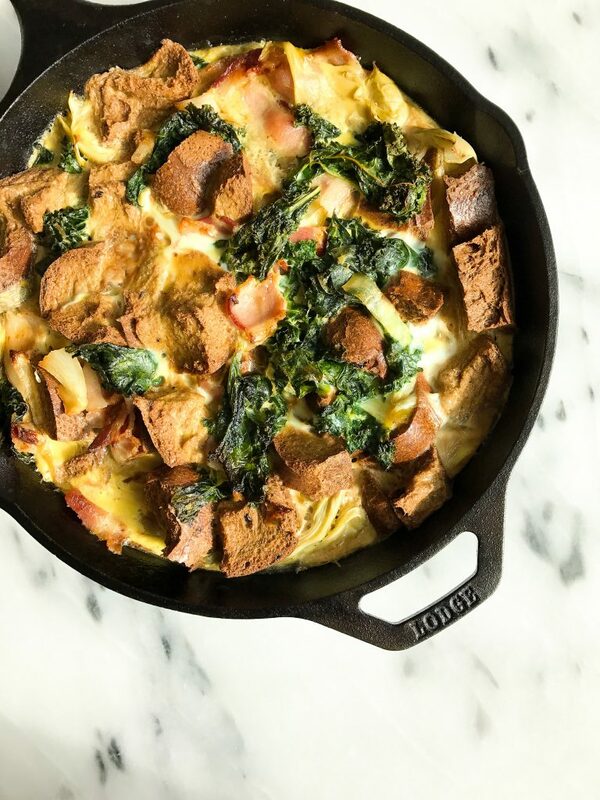 But this Savory Bacon & Kale Breakfast Pudding is seriously so delicious, it was gone in two days over here between Jord and I. 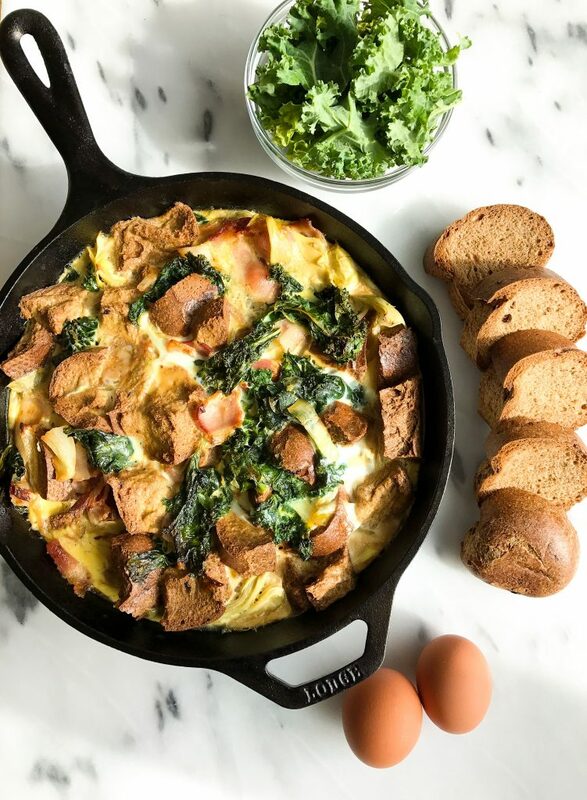 It is so simple and easy to make too and is the perfect recipe for a brunch or family breakfast over the weekend. You can also prep it ahead of time and include it in your “meal prep” for the week. It is a great meal to enjoy post Whole30 for J too because it’s all compliant beside the grain-free baguette (which only has a little honey!). He has been eating pretty paleo-ish during the week since stopping Whole30 and he still notices a huge difference in his digestion and energy levels. It is also amazing that when we go out on weeks and have tacos and some drinks, he is totally fine. I like to call this the definition of moderation my friends. Okay so this savory pudding.. let’s get to it! You can also use a baking dish (8×8 or 9×9) if you do not have a skillet, should cook for similar amount of time! Do you think this would be just as good if I assembled it the night before and baked in the morning (like a strata)? I think you could prep out the ingredients the night before and assemble in the morning. Cook the kale and bacon. Chop the artichokes. Slice the bread. Place all those in the baking dish and cover. I think you could even crack the eggs and store in am airtight container overnight. Then, in the morning, mix together the eggs, milk, and cheese and pour over the other ingredients. You can preheat the oven while doing the last minute prep. This recipe really does look delicious. I can’t wait Tom try it. Ooh it’s like a yummy egg casserole. I’ve really been wanting to try Barely Bread. This Savory Bacon Pudding is a healthy dish for the breakfast. I like your idea. Recently I have made paleo chocolate kale bread. I love your pudding idea for the breakfast, I will definitely try this.